A fully formatted PDF version of this briefing is also available. The international monetary framework which emerged after the collapse of the Bretton Woods system in the 1970s has proved volatile, damaging and prone to crises. It is time for a fundamental redesign and the introduction of a global reserve currency, to help stabilise international exchange rates, smooth commodity prices, promote international economic cooperation, and prevent future financial crises. The current international monetary framework is not really a ‘system’ at all; it has evolved haphazardly since the collapse of the Bretton Woods system in the early 1970s. The Bretton Woods system, set up in 1944, was created to ensure stable exchange rates to help growth and reconstruction after the second World War, and to prevent the return of the ‘beggar thy neighbour’ competitive currency devaluations of the 1930s. The key feature of Bretton Woods was a system of fixed, but adjustable exchange rates, managed by the IMF, and backed by the dollar, whose value was underpinned by the price of gold. The exchange rate of each country’s currency was fixed within very narrow bands, and speculative attacks prevented by national central banks acting in consort, backed by the IMF. Every currency was convertible to dollars, whose price was fixed against gold. If countries found their currency overvalued or undervalued, they could negotiate a change in exchange rates through the IMF. This absence of exchange rate fluctuations was designed to stabilise and standardise inflation, prevent financial crises and promote the growth of trade. To a large extent it succeeded in many of these objectives, but became increasingly difficult to sustain, largely because the system was underpinned by a national currency, the US dollar. Between the creation of the system and its collapse in the early 1970s, the US went from being a major creditor to the rest of the world to becoming a major debtor, partly because of the spiralling costs of the Vietnam war. In 1971, in the face of massive pressure on the dollar by speculators who thought it was over-valued, US president Richard Nixon announced that the dollar would no longer be convertible to gold. By 1973 the Bretton Woods system of fixed exchange rates had been abandoned. There are four main features of the current international monetary system. First, though exchange rates are often described as ‘freely floating’, determined by market supply and demand for currencies, there are in practice a variety of different arrangements in place. Proponents argue that freely floating exchange rates settle at the optimum economic level, preventing undervaluation or overvaluation, and can in theory provide greater stability, and allow countries greater freedom to decide their own monetary policies. In practice, however, floating exchange rates have been characterised by enormous volatility, with wide swings on a daily, monthly and yearly basis, and significant divergence from underlying economic realities. Since the collapse of the Bretton Woods system in the early 1970s, all major industrialised countries have intervened heavily in the foreign exchange markets to protect their currencies, with varying degrees of success. They have also frequently acted in consort to do so. However, international foreign exchange markets dwarf the real economy – over $3 trillion is traded every day – meaning that even the ‘hard’ currencies are ultimately subject to the opinion of the market. Speculators eager to make a quick profit can attack and force devaluation of ‘weak’ currencies. A number of countries still keep their exchange rates pegged to hard currencies such as the dollar (for example Hong Kong and United Arab Emirates) or a basket (for example Russia and Tunisia.) The euro is the most famous instance of the adoption of a single currency for a group of countries, but it is not the only one. For example, eight countries in West Africa are part of the Communauté Financière d’Afrique (CFA). Meanwhile the poorest developing countries have been pushed by the World Bank and IMF towards floating their currencies and developing nascent foreign exchange markets. Second, the dollar retains its position as the world’s reserve currency, though there are signs that this pre-eminence will have a limited shelf-life. The dollar’s central role has two crucial consequences. The first is that it allows the US to borrow cheaply and to continue borrowing indefinitely, with extremely damaging consequences for the rest of the world. A fundamental cause of the current economic turmoil was the huge scale of borrowing by the US government, financed in large part by China and other emerging countries eager to buy US securities to build their reserves. The security provided by this demand for dollars allowed the US government to maintain low interest rates, fuelling the disastrous private-sector borrowing bubble. The second consequence is that American monetary and fiscal policy decisions impact the rest of the world, but the US administration is not forced to think about these impacts when it decides policies. Third, there is little international oversight or control over the international monetary system. The IMF is the institution that was created to play this role. However, since the collapse of the Bretton Woods system, the IMF has been unable to exert much influence over the policies of rich countries. The last time the IMF put conditions on a developed country (before the Iceland loan of last year) was in 1976 when Britain went to the IMF. Since then, the free-floating of exchange rates and ability of rich countries to raise financing on credit markets has meant that the IMF does not lend to rich countries, and thus can not use conditionality. The only influence over rich countries left in the IMF’s toolbox is persuasive power, and this has proved extraordinarily ineffective. Part of the reason for this is that voting rights and power at the IMF remain heavily skewed towards rich countries, with the US retaining a veto over important decisions. This weakens the institution’s independence and dilutes its ability to ‘speak truth to power’. This democratic deficit, combined with the perception that its prescriptions in the Asian financial crisis in the late 1990s were influenced to benefit rich countries, has reduced the IMF’s legitimacy. With a lack of legitimacy, it will be difficult and undesirable to give the IMF a greater role in international monetary arrangements. The fourth main feature of the international monetary system is that its rules, institutions and norms are guided by a particular ideology and economic model. 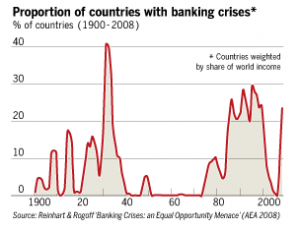 This model, often known in shorthand as the ‘Washington consensus’ was heavily pushed by the World Bank and the IMF. The main feature of this model is a belief in the efficiency of free markets, and a scepticism about the ability of governments to improve on market outcomes. This leads to an emphasis on economic liberalisation, and the reduction of state involvement in the economy, including the privatisation of public services. It also creates an economic model oriented toward exports, which is one of the reasons for the large accumulations of foreign exchange by Asian countries, whose large export surpluses where matched by a US dependence on imports. These large-scale trade imbalances cannot last indefinitely, and threaten major instability when they unravel. This poorly governed international monetary system has created enormous problems for the world, and for developing countries in particular. We highlight four of the most serious. First, it creates a volatile, risky environment for business investment. Even in times of relative global stability, volatile exchange rates damage economic planning and investment in rich and poor countries alike. If there is a lack of stability in exchange rates over the medium- to long-term, where effective markets to hedge risks do not exist, businesses must expect volatility and incorporate that risk into their plans. Investment will be lower, because investments which might be profitable with stable exchange rates will either be unprofitable when risks are included in planning, or not undertaken by risk-averse investors. This reduces job creation, growth, trade and economic development. This is a particular concern given the enormous long term investments that will be required to convert our economies to a low-carbon future. Ultimately exchange rate volatility mainly benefits speculators, while creating enormous costs. Second, the current international monetary system creates enormous risks for small or poor countries who are extremely vulnerable to swings in their exchange rates. In times of crises, they are often forced to devalue their currencies, increasing the cost of servicing foreign debts and making imports, including essential foodstuffs more expensive. The small size of the markets in most developing countries’ currencies makes them targets for speculation and manipulation of their currencies. Time for a global currency? The current crisis has revived interest in reform proposals, and potentially presents the biggest opportunity for change to the international monetary system since 1944. We highlight one key idea: the creation of an international currency and system of international reserve pooling. In practice, this could be achieved through an international clearing union – an idea of John Maynard Keynes, one of the architects of the Bretton Woods system. The clearing union would mean that national governments would no longer need to maintain their own foreign exchange reserves. Instead, they would rely on a pool of reserves contributed by all the nations of the world and managed by the clearing union. This reserve pool would be denominated in a new international currency, such as the ‘bancor’ – Keynes’ idea for a unit of exchange based on international commodity prices. Persistently large trade surpluses and deficits would be penalised by an interest charge, providing incentives for both surplus and deficit countries to change policy to eliminate the imbalances. National exchange rates would be changed, by mutual consent, at the clearing union, based on trade balances. Keynes’ ideas remain an excellent basis to start a new discussion, but need updating in the context of freer mobility of capital and international financial flows. This system could help to stabilise international exchange rates, reduce persisent and destabilising global imbalances and promote international economic cooperation, and should also help to stabilise commodity prices and prevent future financial crises. Reforms to the international monetary system should be rules-based but take into account the diverse needs of different countries. The institution that manages the system must be democratic and accountable. The current crisis has shown that the international monetary ‘system’ has failed to deliver sustainable global prosperity, and has been beset by crises. While the persistent under-development and under-investment in developing countries was evidence of this, the crisis has also demonstrated that it has not worked for rich countries either, where massive losses due to risky financial activity are being paid for from the public purse and economies endured deep recessions. In times of crisis there is much greater political will to create change. Agreement on ambitious but necessary reforms will take considerable negotiation. A fair, transparent process will be needed to undertake these negotiations: one that involves all countries of the world, and is open to civil society and parliaments, under the auspices of the United Nations. This has been demanded by thousands of civil society organisations, but this call has not yet been heeded by the leaders of the G20. As the economic hegemony of the US wanes, there is a practical limit to how long the anachronistic system of a single country’s currency serving as the vehicle for all global reserve holdings can be maintained. The creation of an international currency, international clearing union, and system of globally managed exchange rates should be on the agenda.